It is a horrid abomination to see in Christian temples a painted image either of Christ or of any saint. 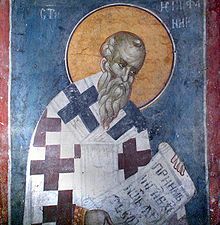 Epiphanius of Salamis (Ἐπιφάνιος, c. 310-320 – 403) was bishop of Salamis, Cyprus, at the end of the 4th century. He is considered a saint and a Church Father by both the Orthodox and Roman Catholic Churches.